A 70-year-old female patient presented with proptosis of right eye for the past 15 days and defective vision in both eyes since birth. She was found to have eccentric painful proptosis of right eye along with features of oculocutaneous albinism. Eccentric proptosis was due to an orbital mass which proved to be a plexiform neurofibroma by histopathological examination. The case is presented for its rarity, as an isolated orbital plexiform neurofibroma without the systemic features of neurofibromatosis is rare and its coincidental presentation with oculocutaneous albinism is yet rare and has not been reported so far. Albinism consists of a group of inherited abnormalities of melanin synthesis and is typically characterized by a congenital reduction or absence of melanin pigment. These disorders are generally sub-classified as oculocutaneous albinism or ocular albinism based on the extent of pigmentation of the skin, hair and eye. Oculocutaneous albinism is a group of 4 autosomal recessive disorders; whereas ocular albinism is X-linked or uncommonly autosomal recessive. The coincidental presentation of oculocutaneous albinism with isolated plexiform orbital neurofibroma without any systemic manifestations of neurofibromatosis is very rare. A 70-year-old female with oculocutaneous albinism, presented with proptosis of the right eye for 15 days and defective vision of both eyes since birth, which got worsened in the right eye for the past 15 days. There was no similar history among family members. Ophthalmological examination revealed visual acuity of HM and 20/400 in RE and LE, respectively. Eccentric proptosis of right eye was seen (27 mm Hertel in RE and 15 mm Hertel in LE) with fullness in the superotemporal quadrant of the right orbit [Figure 1]. Extra ocular movements were restricted in all directions. Anterior segment of both eyes showed iris transillumination defects, a normal pupillary reaction and nuclear sclerosis. Intraocular pressure (IOP) was normal. Hypopigmentation of fundus with foveal hypoplasia was seen in both eyes. 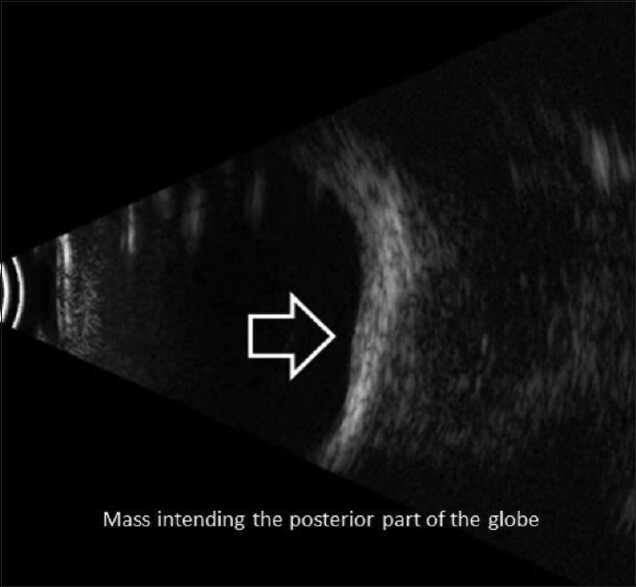 Ultrasound of right eye showed low to moderate echogenic mass in the superotemporal quadrant of the orbit. [Figure 2] Computed tomography (CT) and magnetic resonance imaging (MRI) of orbit showed a well-defined lobulated, elongated mass of mixed intensity, measuring 7.1 × 3.6 × 2.8 cm with well-enhancing solid and non-enhancing cystic areas in the superior part of the right orbit. The mass extended posteriorly through the superior orbital fissure into the right cavernous sinus. Invasion of the lesser wing of sphenoid was also noted. Superiorly there was erosion of roof of the orbit with intracranial and extra dural extension. Optic nerve was displaced inferiorly by the mass. There was erosion of medial wall of the orbit with extension into the posterior ethmoidal sinus [Figure 3] and [Figure 4]. Imaging features were in favor of orbital neurofibroma, so radiologist suggested fine needle aspiration cytology or biopsy to confirm the diagnosis. Excision biospy was performed under general anesthesia (GA). 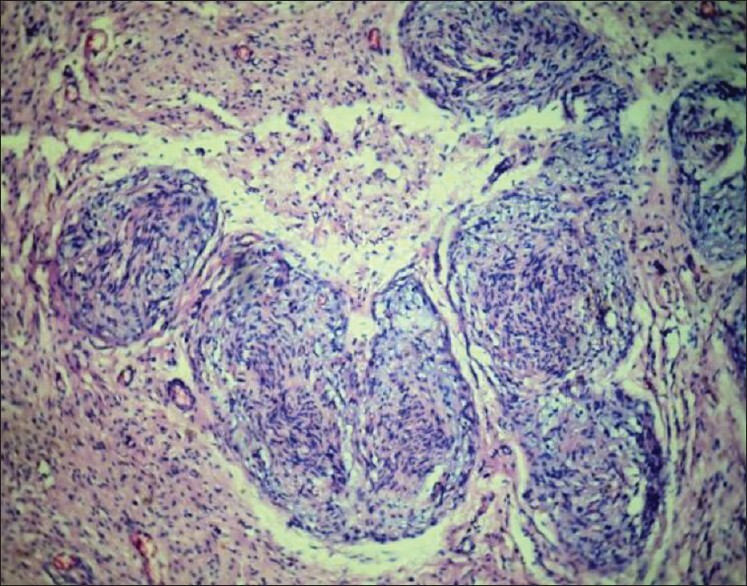 Histopathological examination (HPE) showed features suggestive of plexiform neurofibroma. 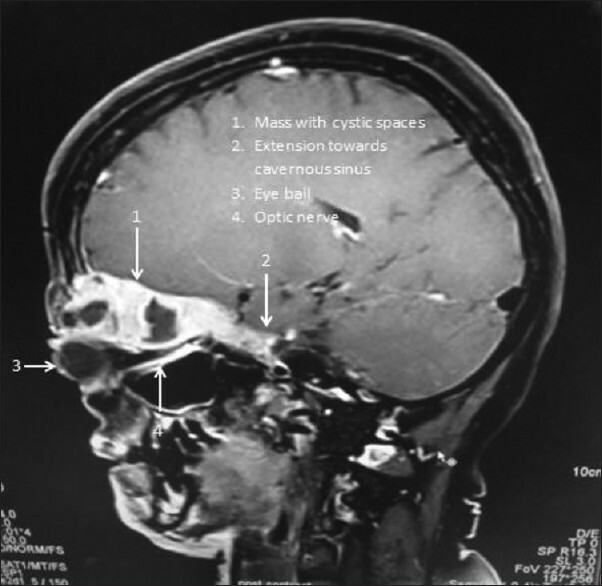 [Figure 5] Neurosurgeon's opinion was obtained. However, they could not guarantee a total extirpation of the intracranial part of the plexiform neurofibroma. Malignant transformation of intraorbital neurofibroma during radiation therapy has been reported. Hence, radiotherapy was not advised. The patient was advised periodic follow up but she did not turn up. Neurofibromas of the orbit are rare and account for 0.6-2.4% of all orbital tumors. They may be of three subtypes namely, plexiform, diffuse and localized neurofibromas. Diffuse neurofibromas are usually the dermal variants; they rarely affect the orbit and are clinically indistinguishable from the plexiform subtype. Though this patient was diagnosed to have plexiform neurofibroma of the orbit, other clinical manifestations of neurofibromatosis 1 were absent. Isolated plexiform neurofibromas without the systemic features of neurofibromatosis 1 have been reported at other anatomical sites;  however, their location in orbit is relatively rare. However, isolated orbital plexiform neurofibroma in association with albinism has not been reported so far. This rare case is reported for the coincidental presentation of oculocutaneous albinism and isolated orbital plexiform neurofibroma without any systemic features of neurofibromatosis 1 in the same patient and probably the first case to be reported. Odebode TO, Afolayan EA, Adigun IA, Daramola OO. Clinicopathological study of neurofibromatosis type 1: An experience in Nigeria. Int J Dermatol 2005;44:116-20. Kuo PK, NI C, Seddon JM, Wu BF, Chen YJ. 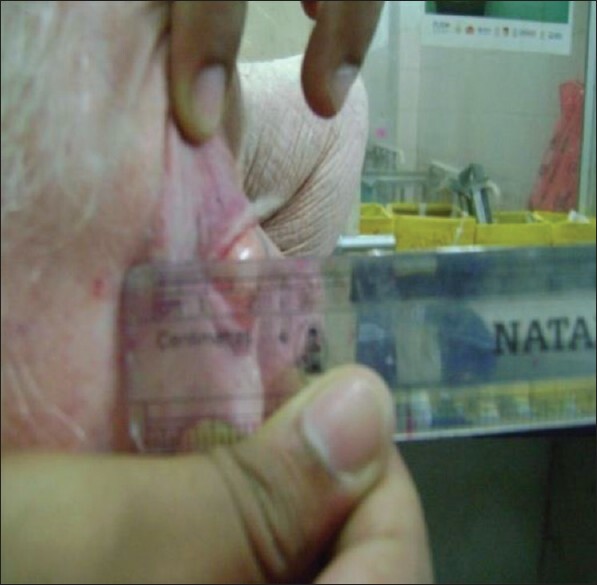 Orbital tumors among Chinese in the Shanghai area. Int Ophthalmol Clin 1982;22:87-98. Porterfield JF. Orbital tumours in children: A report on 214 cases. Int Ophthalmol Clin 1962;2:319-35. Funarunart P, Kayasut K, Hirunpat S, Preechawai P. Isolated orbital neurofibroma in NF-1 negative patients. J Med Assoc Thai 2011;94:1281-2. 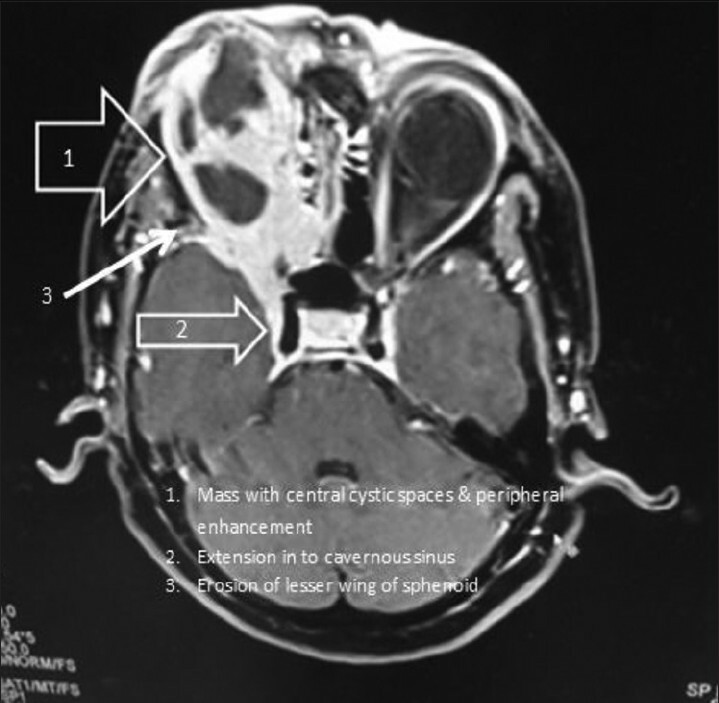 Jamjoom AB, Malabarey T, Jamjoom ZA, Al-Sohaibani M, Hulailah A, Kolawole T. Cerebro-vasculopathy and malignancy: Catastrophic complications of radiotherapy for optic nerve glioma in a von Recklinghausen neurofibromatosis patient. Neurosurg Rev 1996;19:47-51. Henderson JW, Campbell RJ, Farrow GM, Garrity JA. 3 rd . New York: Raven Press; 1994. Orbital tumors; pp. 221-37. McLean IW, Burnier MN, Zimmerman LE, Jakobiec FA. In: Atlas of tumor pathology. 3 rd . Rosai J, Sobin LH, editors. Washington, D.C.: Armed Forces Institute of Pathology; 1994. Tumors of the eye and adnexa; pp. 101-27. Krohel GB, Rosenberg PN, Wright JE, Smith RS. Localized orbital neurofibromas. Am J Ophthalmol 1985;100:458-8. Blakley P, Louis DN, Short MP, MacCollin M. A clinical study of patients with multiple isolated neurofibromas. J Med Genet 2001;38:485-8. Jank S, Raubenheimer EJ, Bouckaert MR, Obrist P, Bodner G, Rudisch A, et al. Intraorbital plexiform neurofibroma in an NF-1-negative patient. Dentomaxillofacial Radiol 2007;36:240-4. Olasode OA, Olateju OA, Olabanji JK, Olasode BJ. A review of Oculocutaneous Albinism and its syndromes. Egypt Dermatol Online J 2006;2:6. Keshav BR, Mohammed MJ, Mahmood N. Oculocutaneous Albinism associated with Axenfeld's Anomaly Three case reports. Sultan Qaboos Univ Med J 2010;10:111-3. Bradley WG, Richardson J, Frew IJ. The familial association of neurofibromatosis, peroneal muscular atrophy, congenital deafness, partial albinism, and axenfeld's defect. Brain 1974;97:521-32.